The guitar is a noble instrument that creates beautiful music. It is easy to learn and can be used to create a wide range of sounds. It is also one of the few instruments that are harder to duplicate on the keyboard. That is why guitarists are a special breed. 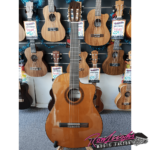 Classical guitars in Australia are great instruments especially if you want to learn the guitar. They mostly comprise of nylon string guitars and are always suggested for the beginner guitarist. This is not only for the fact that they create a great sound, but also because they are easy on the player’s fingers. However, classical guitars are not just learning instruments. Many established musicians use it to play both classical music and pop music. So no matter what genre you want to play in, a classical guitar is an ideal way to get started. 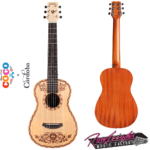 We have a wide collection of classical guitars that range from cost-friendly to high-end expensive guitars. We feature some fine guitars from renowned brands like Cordoba, Ortega and Esteve. 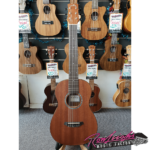 Or if you are looking for something slightly inexpensive as a starter guitar, instruments from Yamaha, or Valencia are also ideal. Classical guitars in Australia are great to play. They are fun instruments and great as starter guitars. 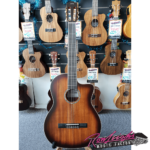 At Ron Leigh’s Music factory, whether you are looking for beginner guitars or something more professional, we will be able to get you an instrument that best suit your music aspirations. Copyright ©2019 Ron Leigh's Music Factory.